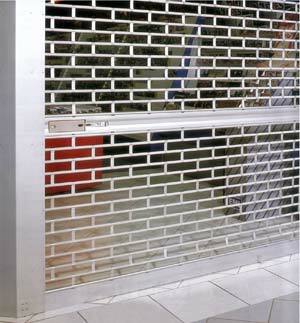 At Advanced Shutters, roller shutters and roller grilles are our specialty. Our family run business based in Sydney has been manufacturing roller shutters since 1976, so you can be assured of dealing with an experienced and reputable company. Roller shutters & roller grilles in general are a great way of providing a barrier while maximising limited space - by rolling up and out of the way they provide an unobstructed passage way when open. 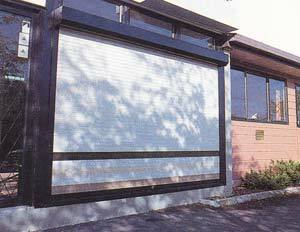 We have one of the largest range of roller shutters, security shutters, window roller shutters and roller grilles on the Sydney market catering for residential and commercial applications with solutions suitable for homes, town houses, shop fronts, shopping centres, car ports, garage doors, offices, storage areas, retail outlets, food counters, clubs, pubs, restaurants, cafes, and many others. 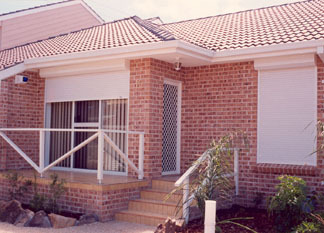 All our roller shutter & roller grille products are manufactured in our Belmore NSW factory. We also distribute our products throughout NSW and Australia wide. 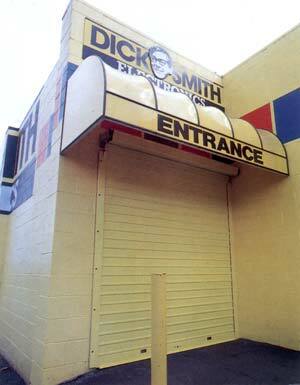 Each roller shutter product in our range has different characteristics catering for different needs. These may include security, privacy, and protection from various elements. Browse through the product summaries listed below or refer to our roller shutter & roller grille comparison chart to determine the most suitable product based on your needs. If you have any questions or would like to organise an onsite free measure & quote, simply contact us - we will be glad to help. Our PROEX series of 40 mm extruded aluminium roller shutters are amongst the strongest and most versatile solutions available. Suitable for commercial and residential applications, where stronger security, bushfire protection and storm protection is desired. PROEX roller shutters are also suitable for commercial shop front applications in shopping centres, shop windows, retail outlets, servery food counters, bars, pubs, hotels, kitchens, kiosks, cafes, restaurants, factories, and warehouses. 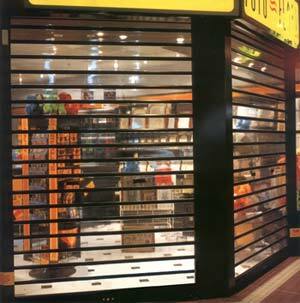 Knightguard Visionline aluminium & polycarbonate roller shutters are suitable as shopfront shutters for shopping centres and for commercial applications on shop windows, servery counter tops, cafes and restaurants but are also suitable for residential applications such as closing off verandahs, patios and other outdoor areas. Knightguard Visionline polycarbonate roller shutters provide a robust barrier with protection and security from intruders, dust and vermin while allowing clear vision through the roller shutter for maximum visibility and light transmission. When used to close off exterior areas, Visionline roller shutters are also great for keeping out those cold breezes in winter. Knightguard heavy duty shuttergrille aluminium commercial roller shutters are the strongest and toughest security roller shutters in the Knightguard range providing first class protection, design flexibility and eye-catching appearance. Knightguard Heavy Duty Shuttergrille aluminium commercial roller shutters are ideal where a strong security roller shutter solution is needed and suitable for your commercial shop front, shopping centre, shop window, retail outlet, warehouse, factory, storage area, store room, servery, counter, bar, pub, hotel, kitchen, kiosk, cafe, restaurant and home outdoor roller shutter needs. Knightguard Economy roller grilles are a commercial entry-level roller grille solution that provides a physical barrier while allowing unrestricted airflow, light transmission and full visibility through the roller grille. The Knightguard Economy roller grille interconnecting "Nylon 6" polymer "H" links which make up the Knightguard Economy roller grille curtain offer medium strength, wear resistance, abrasion resistance and good resiliency. 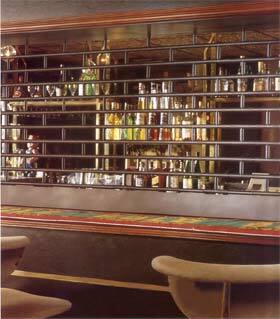 Knightguard Economy roller grille is suitable for internal shop window, retail outlet, warehouse, factory, storage area, store room, servery, counter, bar, pub, hotel, kitchen, kiosk, cafe, restaurant and home outdoor roller shutter needs. Knightguard Security roller grilles are an ideal solution where strong security is required that provides a physical barrier while allowing unrestricted airflow, light transmission and full visibility through the roller grille. The Knightguard Security roller grille is high in performance. The interconnecting aluminium links which make up the Knightguard Security roller grille curtain offer high strength, toughness and great looks. Knightguard Security roller grille is suitable for your internal commercial shop front, shopping centre, internal shop window, retail outlet, warehouse, factory, storage area, store room, servery, counter, bar, pub, hotel, kitchen, kiosk, cafe, restaurant and home outdoor roller shutter needs.